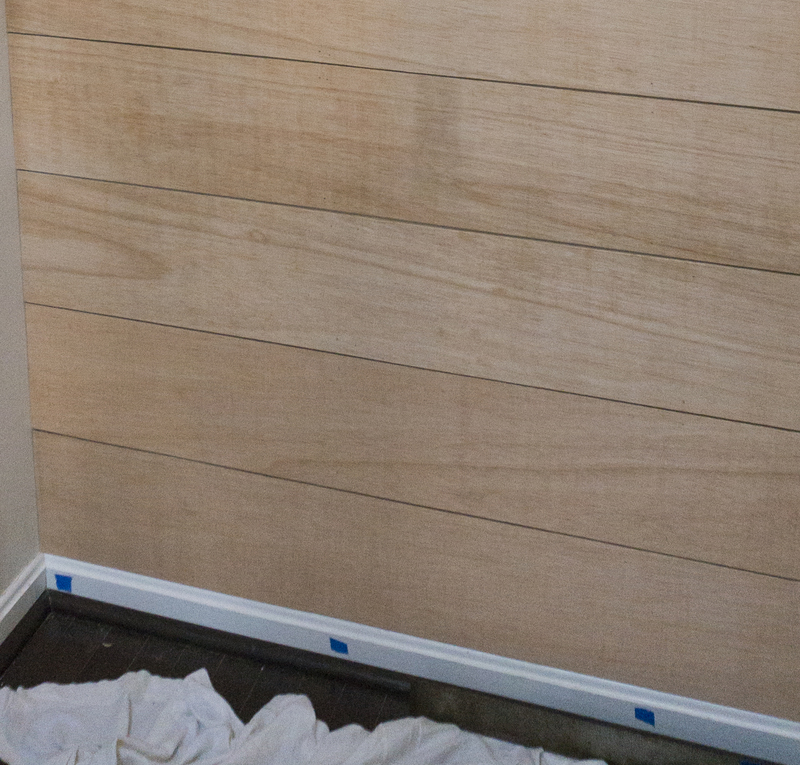 Our entry spent it’s weekend getting Chip & Joanna-fied aka the shiplap went up. After drooling over shiplap the past few years, I am so excited to finally have a little bit of our own. While we would have loved to have been able to afford real shiplap, it just wasn’t in our budget. So we opted to use plywood instead for faux shiplap. The only reason we were able to even complete the shiplap project was because of my parents. My Mom figured out all of the measurements and board sizes while my Dad was the project manager of the shiplap project. I was his not-so-handy sidekick. My Mom took the kids out for the two days and my husband worked on other projects around the house while my Dad and I got to work. By Sunday night, the foyer had completely transformed. 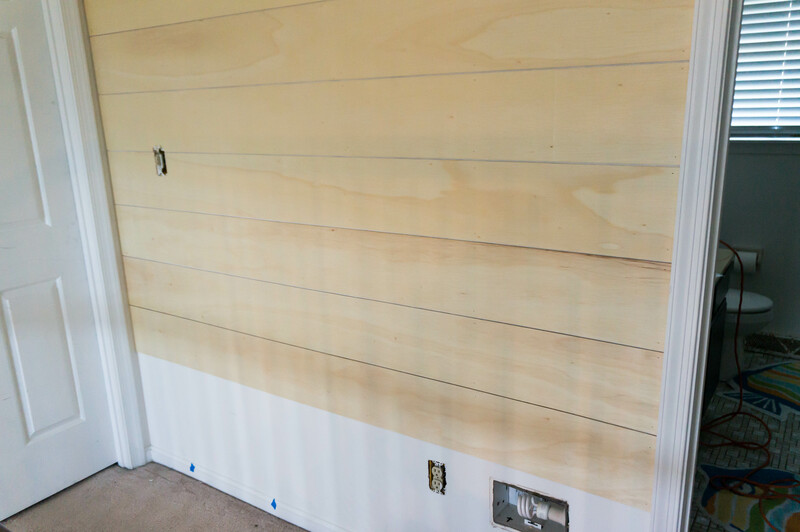 To shiplap a few walls in our entry, it took six plywood boards. We decided to go with quarter inch plywood so that it would flow more seamlessly with the moldings. In some Facebook groups I have read that people have had success asking their local hardware store to make the plywood cuts for them (some people were able to get this for free while others paid). 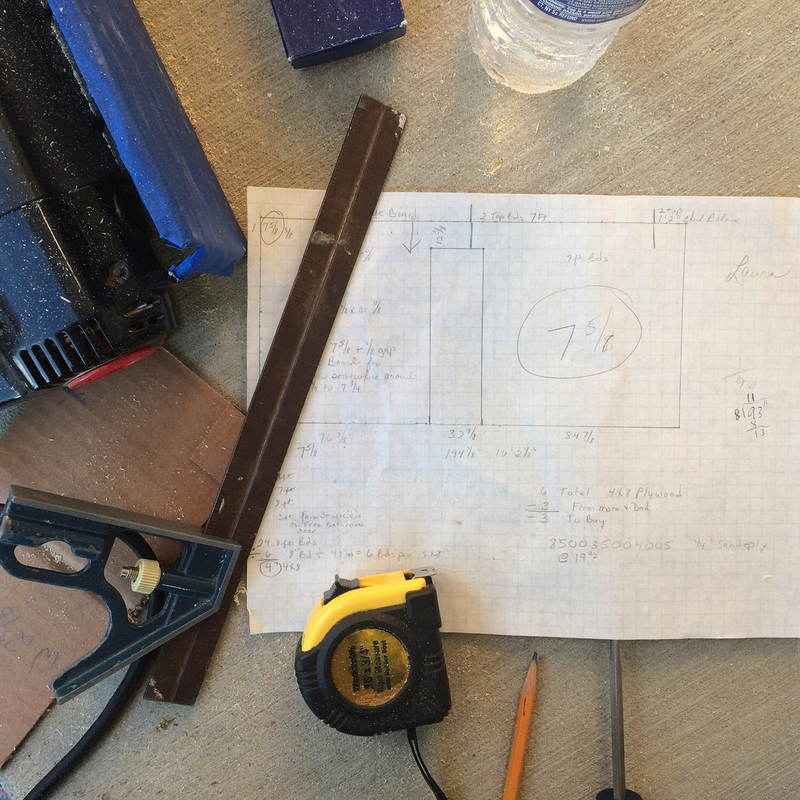 These are my Mom’s very detailed drawings and measurements. Notice how it says Laura on it? That’s because my parents are always helping on projects in our houses – she had to make sure this one wouldn’t get confused with my twin’s shiplapped space. 1. Measure the walls, twice. 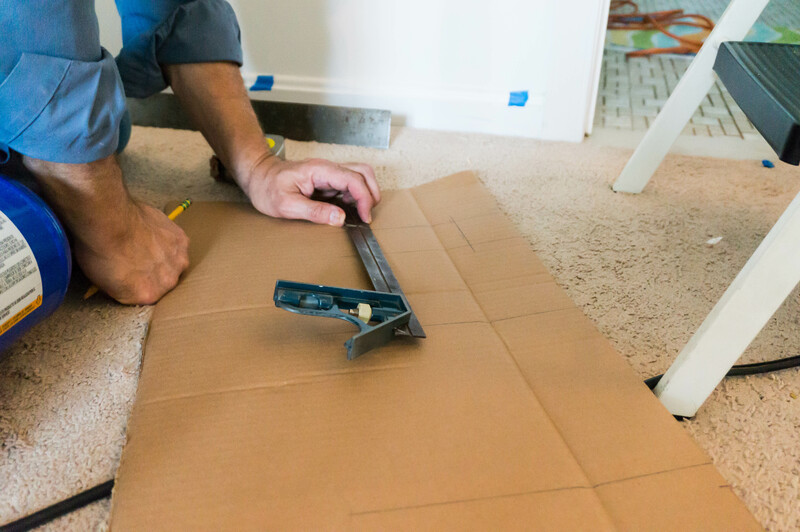 Make sure to measure every bit of space you will be shiplapping. 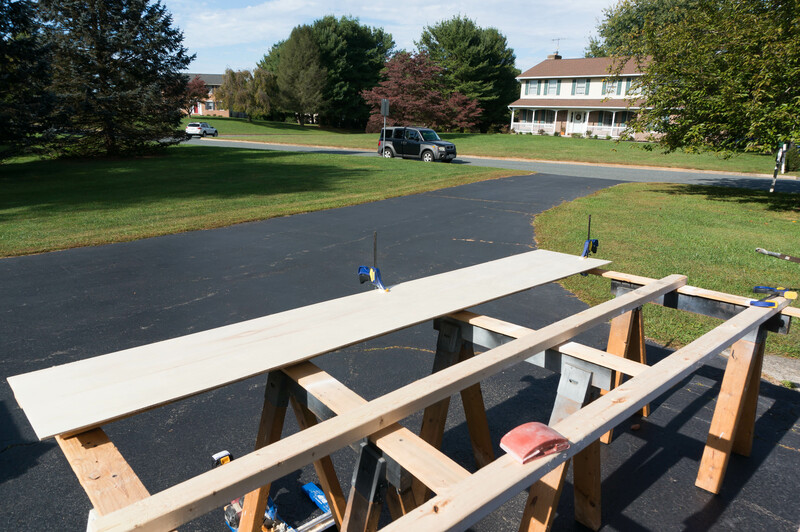 To determine the width of your boards, it’s best to take the height of your space and divide it evenly. It’s okay if the bottom board is a little bit smaller or bigger than the others, but you don’t want to have like 8 boards all the same size and then one board that is half the size of the others. It’s better to have 9 boards that are a little more evenly sized. 2. Find the Studs on the walls and mark all of them. We marked ours by placing a piece of painters tape on the trim in-line with each stud. We used a stud finder to find the studs. 3. Decide if you’re going to try to make a seamless look or if you want to vary your plank lengths. We decided to go for a seamless look because we would only have two small areas that would need to be patched in our project. 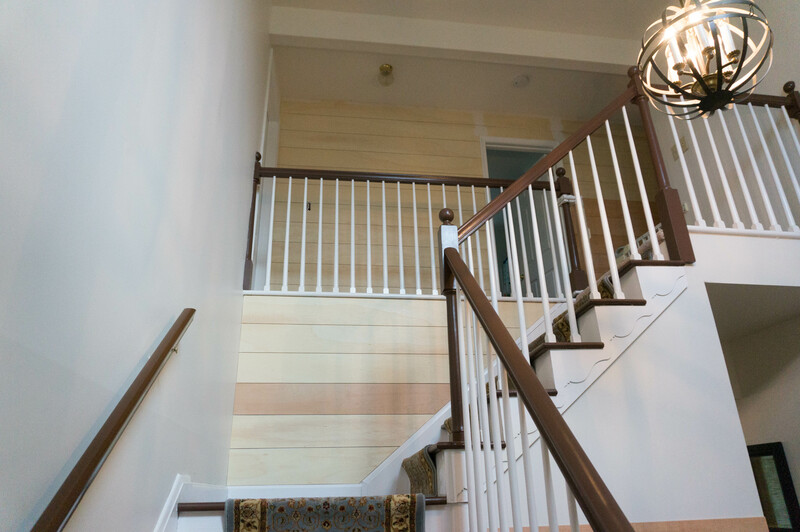 When my parents completed my sister’s shiplap project, they chose to cut the boards in varying lengths to create a look similar to hardwood floors. 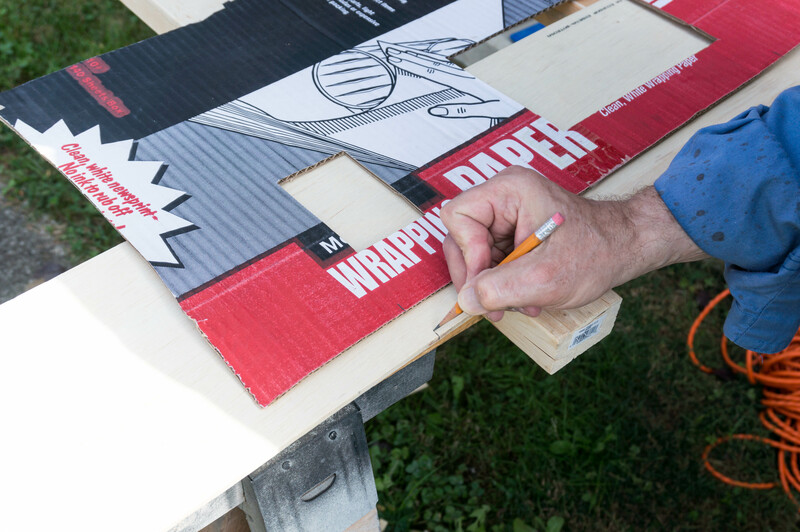 Based on your decision, you’ll know the lengths to cut your boards. 4. 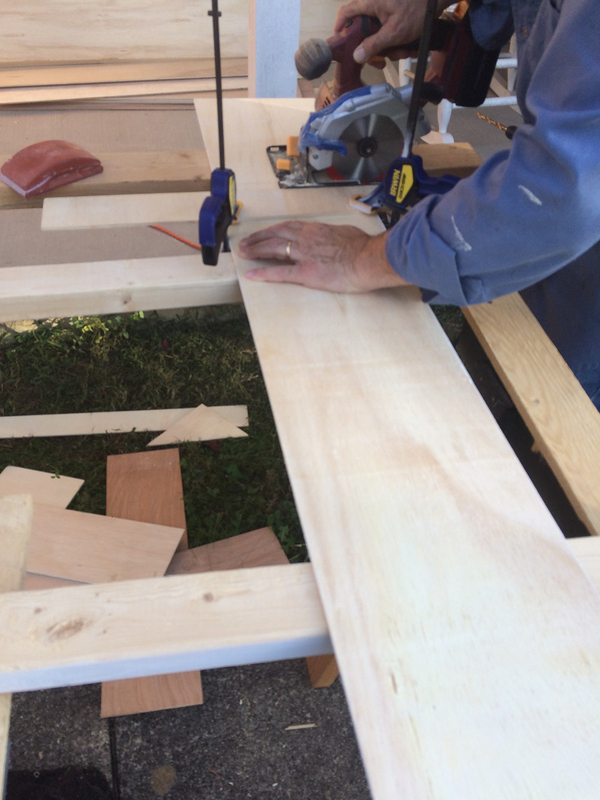 Get your planks pre-cut by a local hardware store, or cut them yourself using a tool such as the Kreig Rip-Cut. Cut them to the plank height you determined based on number one. 5. Cut the planks to the length needed (based on number one). You may have to check your lengths as you go along for each board. Turns out my entry walls aren’t squared. This means that the boards had to be different lengths as we went down the wall. We had to measure and cut each one as we went. 6. Sand each board with 120 grit sandpaper. 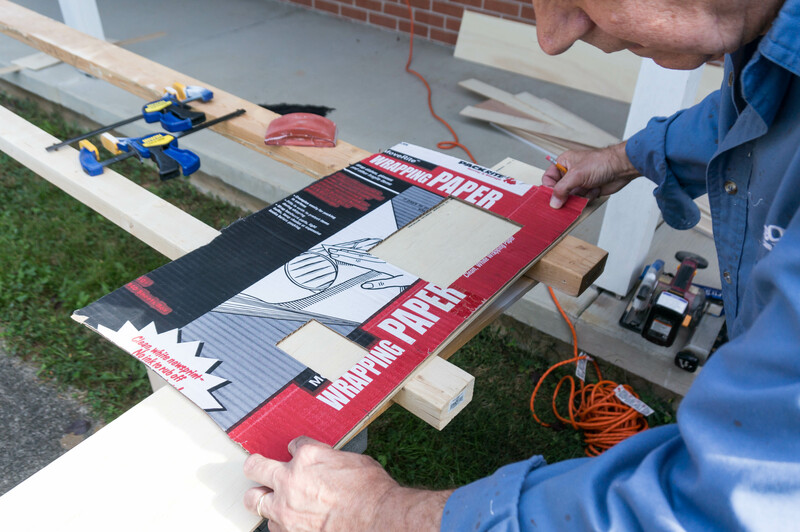 Wipe the boards off with a rag or towel so you don’t bring the saw dust into the house. 7. 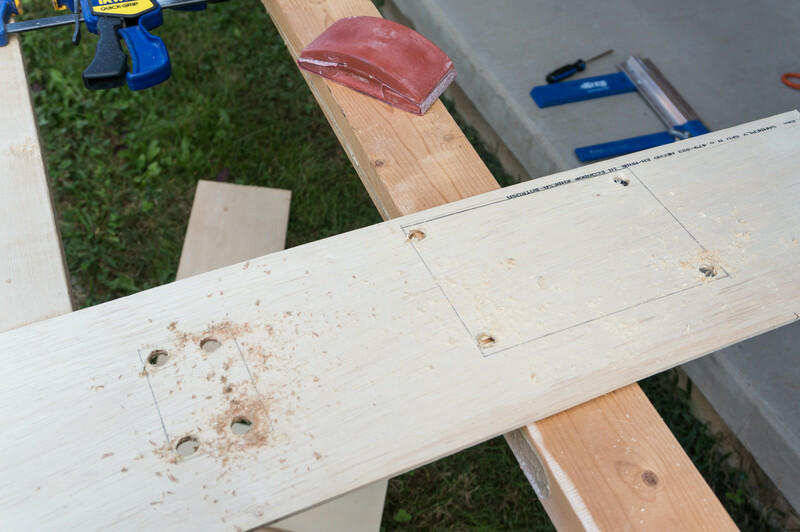 Using a nailgun, nail the first board on the wall (start either at the top or the bottom). Place a nail far left or far right into the stud at the top of the board. Then place a nail at the top of the board and bottom of the board at each stud. 8. Hold your next board up on the wall. Place a spacer in between it and the previous board that is already nailed to the wall. 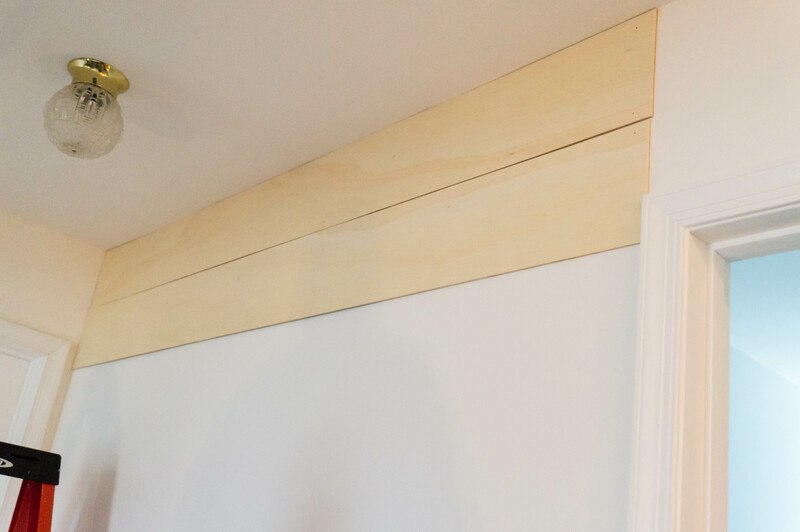 The spacer helps to give you an even space between each board (which creates the shiplap look). We used a square because it was 1/8 inch thick. You could also use tile spacers or nickles to space the boards. 9. 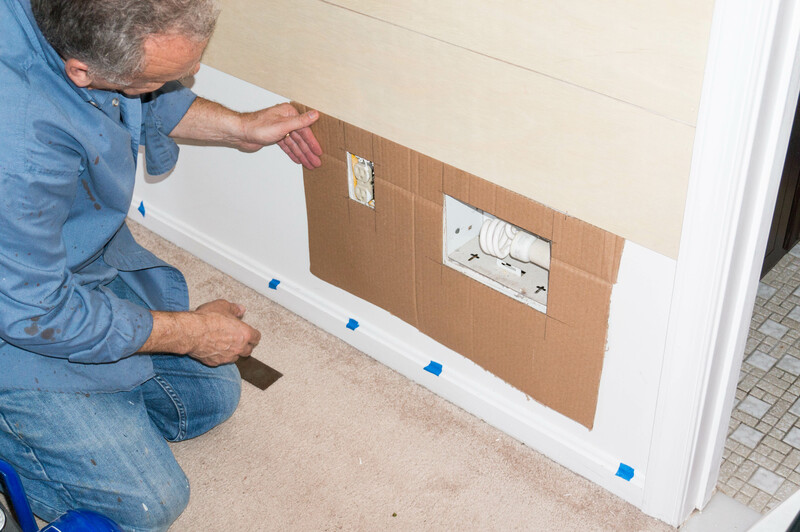 Once you have your spacers in place and the board in place, nail the board to the wall again at the top and bottom of the board at each stud. 10. Repeat steps until you have all of your boards hung. 11. For boards that have odd cutouts (such as outlets or switches), I suggest using cardboard to make a template. 12. Once all of the shiplap is up, prepare to paint. Tape your walls and trim where needed to protect your unshiplapped walls. 13. 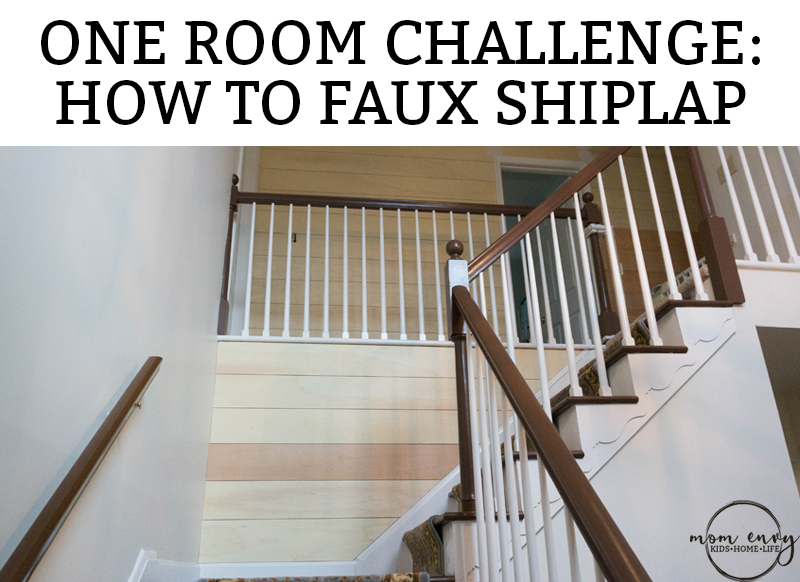 Prime your shiplap or use paint and primer in one (which is what I did). You will need 2-3 coats of paint to cover the shiplap. Over the next couple of weeks, I’ll finish painting the shiplap, start my entry piece remodel, work on the artwork, and look for decor for the entry piece. We already finished the light, which I will share about next week. beautiful panels and love how you did it perfectly with the template trick! sorry about the roof but hope all is well by week 3! Thanks for stopping by Tim! Love your guest room inspiration for your room! I’m getting excited for the big reveal! I love this look. You are so lucky to have such helpful parents nearby! Thanks, Grace!! I am definitely blessed!! 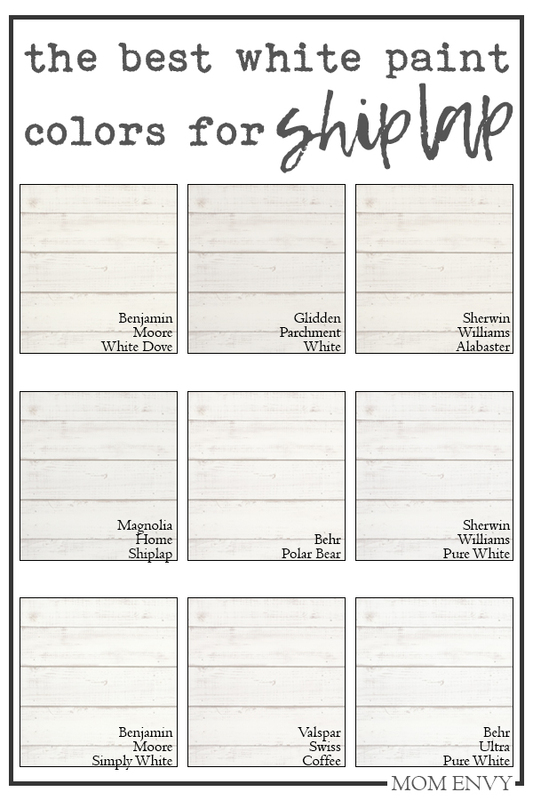 The shiplap will be stunning! Thank you for sharing the template tip — I have to cut faux brick panels and that template is perfect (and perfect timing!) for figuring how to cut around some things on the wall. 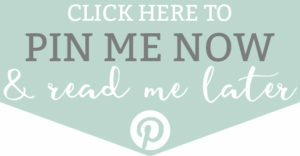 I look forward to following your progress! Thanks so much, Deb! The cardboard template really saves a lot of headaches. I should have video’d how he made them to make it easy to understand. Good luck with your basement, your ideas for it sound great! He’s going to love hearing everyone’s excitement over the template 🙂 Thanks for stopping by!